During 1554 the wealthy cloth merchant Thomas Dolman (1510-1575) purchased the manors of Shaw and Speen, along with a considerable amount of land for £600 (£250k today) from the Crown. 1575 Thomas Dolman died, aged 65. He left the manors of Shaw and Speen to his second son Thomas (1543-1622), the elder son John contested the will successfully and acquired Shaw manor. 1577 Thomas Dolman II purchased Shaw manor from his brother, and started the building of a symmetrical H-plan Elizabethan manor house, with two wings separated by a central range. The roof timbers would come from oak trees that would be locally felled during 1579 and 1580. The house was built next to the 12th Century St. Marys Church that later members on the Dolman family would be buried. 1581 Shaw House was completed at the cost of around £10,000 (£2.7m today). 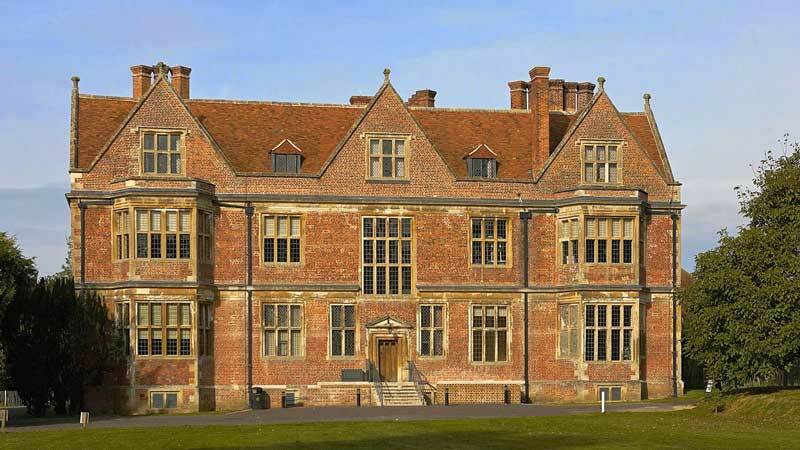 The magnificent looking house had soaring gables and clusters of tall chimneys, these helped make the building clearly visible from the major routes that passed through Newbury. The main entrance to the house was through a large central stone entrance porch, giving the stately house a grandeur look, a design that was popular towards the end of the 16th Century. The red brick for the main walls were made locally from the kilns of small brickworks at Clay Hill and Brickkiln Wood just north of Shaw, and the upper stonework of the building was from Bath. The house would become one of the earliest to have a completely symmetrical façade, which the mullion windows gave no hint of the interior layout of the building. Thomas was aware of the jealousy that Shaw House would cause, so Thomas had inscriptions written in both Greek and Latin on the south entrance porch. The inscriptions read 'Let no envious man enter' and 'The toothless man envies the teeth of those who eat and the mole despises the eyes of the stag'. On the south porch plinth that was made from stone (from Headington in Oxfordshire), the build date of 1581 was carved in Roman numerals (MDLXXXI). 1603 During this period of time it was a mark of honour to have a visit by a the monarch, the Dolmans had succeeded in having a royal visit of the newly crowned King James I (1566-1625) and Anne of Denmark. The royal visitors would have enjoyed a grand banquet within the great hall. 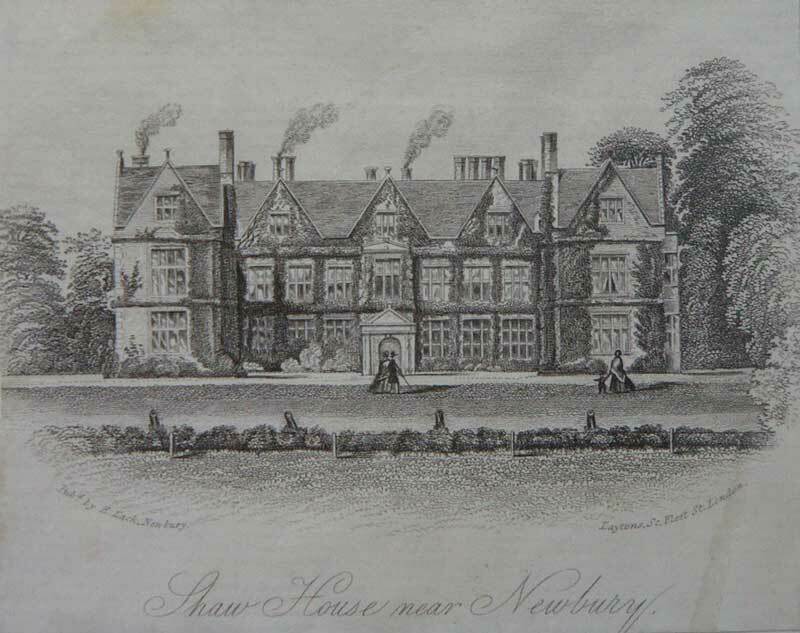 May 1612 Robert Cecil, 1st Earl of Salisbury (1563-1612) and the Secretary of State to King James I, stayed at Shaw House. At the time he was suffering poor health and worn out by years of overwork, he looked prematurely aged. He was on his way towards Bath in hope of a cure, but he obtained little relief. Robert died in great pain of cancer on his journey back from Bath at Marlborough in Wiltshire on 24th May 1612. 4th September 1612 Anne of Denmark made another visit to Shaw House. 22nd January 1622 Thomas Dolman II, aged 80 died. 1622 Humphrey Dolman (1593-1666) inherited Shaw House. May 1641 Humphrey refused to sign an oath to show loyalty to King Charles I (1600-1649), and to defend the Church of England against Catholicism, this made his position clear that he was Parliamentarian. Humphrey's son, 20 year old Thomas Dolman III (1621-1697) took the oath to become a supporter of the King, resulting in the outcome that Humphrey and Thomas became divided in their political allegiance. 22nd October 1644 Shaw House became an integral part of the Royalist defensive positions, it has also become the Royalist Headquarters for the Second Battle of Newbury. It is not known of where Humphrey was during the Royalist occupation of the House. 26th October 1644 The Parliamentarians had a large army to the east of Shaw at Thatcham. The Royalists had a much smaller army, but they had the advantage of strong defensive positions which Shaw House has become with the river and marshy ground to the south of Shaw, along with the raised terraces around the garden area. A tale that has been passed down through the years suggested that during the morning of the battle, the King was getting dressed in a room on the first floor of the south-east of the building. A Parliamentarian solder fired his musket, the musket ball went through the window and narrowly missed King Charles I and lodged itself within the wooden panelling. Today a brass plaque marks the spot of the hole the musket ball left. The story is not true, the King was not present at Shaw House or the Second Battle of Newbury. 27th October 1644 During the middle of the afternoon, the Parliamentarians attacked from the west of Shaw. Luckily for the Royalists, the Parliamentarian attack from the west was delayed due to a mistake by the Earl of Manchester. Lord Jacob Astley organised his Royalist infantry to gain cover behind the raised garden terraces to fire upon the advancing Roundheads while maintaining position. After a fierce battle and heavy losses on both sides, the Parliamentarians abandoned the attack. The Battle was not over, late afternoon the Parliamentarian infantry under the command of the Earl of Manchester, advanced on Shaw House. Just as in the earlier battle, the Royalists gave fire from the cover of the raised gardens, resulting in more fierce fighting and heavy Parliamentarian casualties. 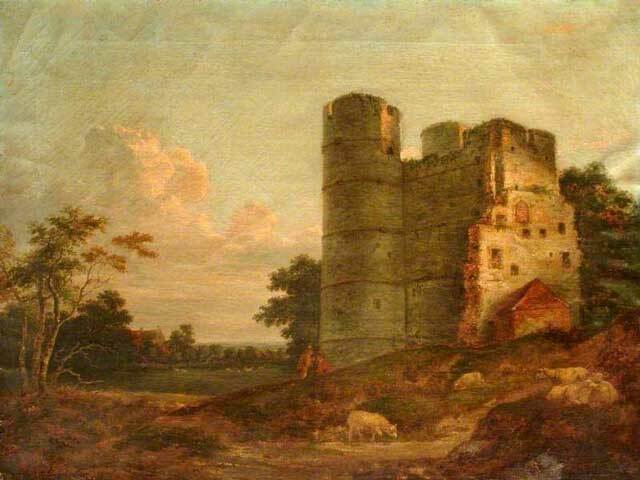 The Royalists retreated under the cover of darkness, Lord Jacob Astley along with the infantry and guns went to Donnington Castle. The house had suffered some damage during the battle, with musket shot that is still visible around some parts of the building today. 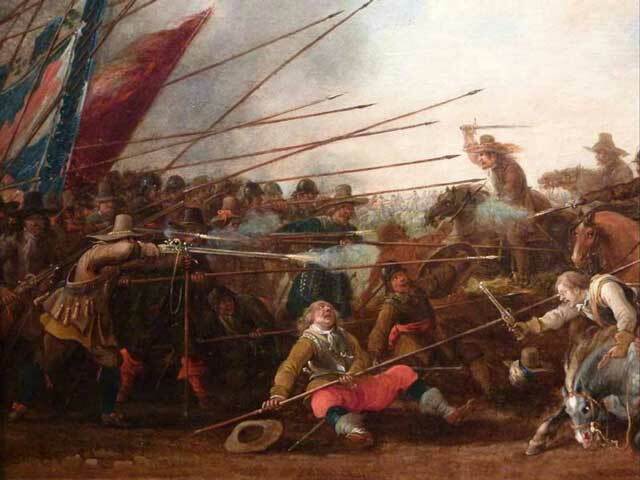 1645 The Dolmans had a reversal of fortunes with the eventual defeat of the King's Royalist forces, marking the end of the English Civil War. 1647 Now that England was under Parliamentary rule, Humphrey was nominated as a member of the Parliamentary Committee of Berkshire. Thomas had his assets confiscated by the Parliamentary Commissioners. 1660 England came under the rule of the Monarchy with King Charles II (1630-1685), this effected the Dolmans once again. Humphrey's name no longer appeared on any official documents. February 1661 Thomas was knighted for his loyalty to the Monarchy during the years of the Civil War. Sir Thomas became an Member of Parliament for Reading in Berkshire and was appointed as a Justice of the Peace. September 1663 Sir Thomas would receive a royal visit, he would be the host at Shaw House for King Charles II and James, Duke of York (1633-1701). 13th May 1666 Humphrey, in bed within an upper room of Shaw House, dictated a will leaving all his estate to his son Sir Thomas Dolman. Shortly after, Humphrey Dolman died. 1697 Sir Thomas Dolman died, he was buried at St. Mary's Church in Shaw alongside his wife Dame Margery who had died in 1686. Before his death he had made a will that stated “my first funeral to be in no ways expensive but in a private manner”, the will also showed that Sir Thomas had spent a lot of the fortune the Dolman family had previously amassed. The estate would be left to Sir Thomas's son, also named Thomas. 1697 Sir Thomas Dolman IV (1657-1711) took over the ownership of Shaw House. 1703 Queen Anne visited Shaw House for two days to break her journey up from Bath to London. Before the arrival of the royal visitors, Shaw House and the grounds went through some renovation work, which resulted in displaying the latest fashions in architectural and garden design. On arrival, Queen Anne was given the use of the all the rooms on the first floor, they would have been specially developed with Queen Anne in mind during the renovation work. During November of the same year, Thomas became knighted. 1705 Sir Thomas was now appointed as Deputy Lieutenant of Berkshire and a Member of Parliament for Reading. 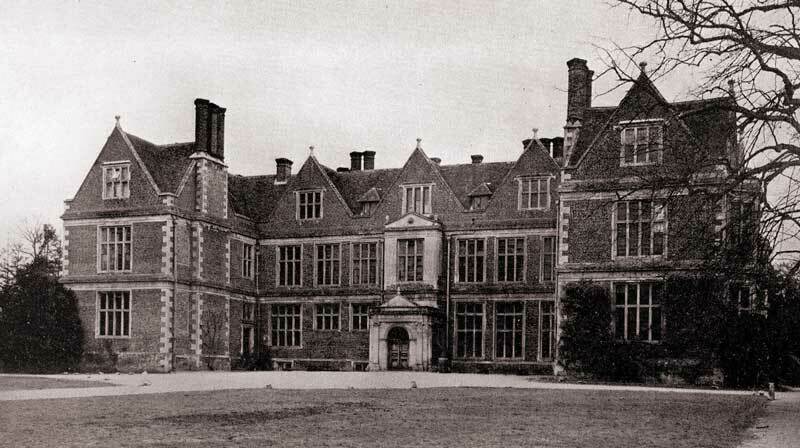 Sir Thomas was known to travel between Shaw House and his other properties he had in London and Essex. 1711 Sir Thomas died, he was buried at St. Mary's Church in Shaw. Sir Thomas had no surviving children so the estate was left to his wife Dame Dorothy Dolman (nee Bell). Dorothy married John Talbot. 1720 Dame Dorothy and John had a son, they named him Lewis. It was during this time that what would become lengthy negotiations with James Brydges for the sale of Shaw House. 1724 Dame Dorothy Dolman died, she was buried at St. Mary's Church in Shaw. The estate was left to Lewis Dolman-Talbot who was aged just four years old. 25th March 1728 James Brydges, 1st Duke of Chandos (1673-1744) became the new owner of Shaw House having agreed to pay £28,441 (£3.6m today) after the lengthy sale. This sale marked the end of the Dolman family's ownership of the Shaw House estate. September 1729 The Duke had some minor renovation work done by Jonathon Hicks, a Newbury builder. The mullion windows on the dining room and the Duke's dressing room at front of the house were replaced with sash windows, due to the windows leaking. Mr Hicks left the initials 'JH' high up on the north front of the house, still visible today. The masonry needed repairing and cleaning, and the out of date plumbing was brought up to date. The architect Edward Shepherd was employed to update the dining room, and the canal engineer John Hore updated the south garden with an elaborate water garden built as a semi-circular basin that was fed by the nearby river Lambourn. April 1730 The Duke wrote to Edward Shepherd, the architect with the following instructions: “As we have several Indian pictures, I would have the sides of the room he is altering intended for the Dining Room, to be workt out into stucco panels, so that they may fit each Picture." He also had the Dining Room painted and gilded, the stucco panelling with egg and dart mouldings still survive today. 1735 Cassandra, Duchess of Chandos died. 1736 The Duke married Lydia Davall, he would spend most of his time at his house in London. 1744 The Duke of Chandos died, the estate of Shaw House was left to his son Henry Brydges, 2nd Duke of Chandos. The Duchess would move back to live in the house again. November 1750 Lydia Catherine, Duchess of Chandos died, she was buried at St. Mary's Church in Shaw. Shortly before her death she negotiated the sale of the estate of Shaw House on behalf of the 2nd Duke of Chandos to Joseph Andrews. 1751 Joseph Andrews (1692-1753) became the new owner of the Shaw House estate, he was a very wealthy man with a substantial income from the ownership of properties in London, and part ownership in sugar plantations overseas in Jamaica and Dominica. Joseph changed the name of Shaw House to Shaw Place, he also planned to further modernise the house, unfortunately those plans did not happen as just after two years of ownership he died. 1753 Sir Joseph Andrews II (1726-1800) was 26 years old when he inherited the house from the death of his father. 20th October 1758 Records show that Joseph paid £1,000 (£134k today) to the Royal Exchange insurance to insure Shaw Place for the eventuality of a fire. A lead plaque No.34640 is still visible above the doorway on the west front of the building. 19th August 1766 After a royal visit to Shaw Place by King George III and Queen Charlotte, Joseph is said to have paid a voluntary subsidy in support of the King against the turbulent proceedings that were happening in Ireland. Joseph became 1st Baronet Andrews of Shaw. 6th May 1795 Joseph was known to give many donations to the poor of the parish. He was instituted in a new scheme called the 'Speenhamland Act' that local magistrates held at the Pelican Inn along Bath Road in Speenhamland (Parish of Speen), this scheme was a practice of economic relief for the poor, it was based on the price of bread and the number of children a man had. This was due to a series of bad harvests that had put wheat in short supply which made the price of bread rise sharply, resulting in a spate of food riots. The scheme was adopted across England to mitigate rural poverty. 29th December 1800 Sir Joseph Andrews II died aged 73, he was buried at St. Mary's Church in Shaw on 7th January 1801. Joseph had been married twice and had no surviving children, Shaw Place and his title was passed to his half-brother, James Pettit Andrews and Anne Penrose's son, named Joseph. 1800 Sir Joseph Andrews III, 2nd Baronet Andrews of Shaw (1768-1822) inherited the estate of Shaw Place at the age of 32 from his father. Joseph had risen through the ranks in the army since aged 16, he was a Lieutenant in the 1st Regiment of Foot Guards when fought in the campaign at Flanders in 1793. He finished his Military career as a Colonel, in the Newbury Volunteers. 27th February 1822 Joseph died aged 53 and unmarried, he would be the last to have the title of Baronet of Shaw. Joseph wrote a will before his death, he would leave the Shaw Place estate to his sister Elizabeth, but if she had no direct heir, the estate was to be passed to his cousin, the Rev Dr. Thomas Penrose. 1822 Elizabeth Hunt (nee Andrews) (1771-1822), married to Charles Hunt inherited Shaw Place from her brother's death. She had a sash window removed for a sloping ramp built in the centre of the south east room to allow access to the gardens. The formal gardens had been replaced by tall conifers that framed the view of the house. Elizabeth tragically died within five months of her brother, childless. 1822 Rev. Dr. Thomas Penrose (1770-1851) the vicar of Writtle Parrish in Essex, and son of Joseph's mother's brother became the owner of the Shaw Place estate. 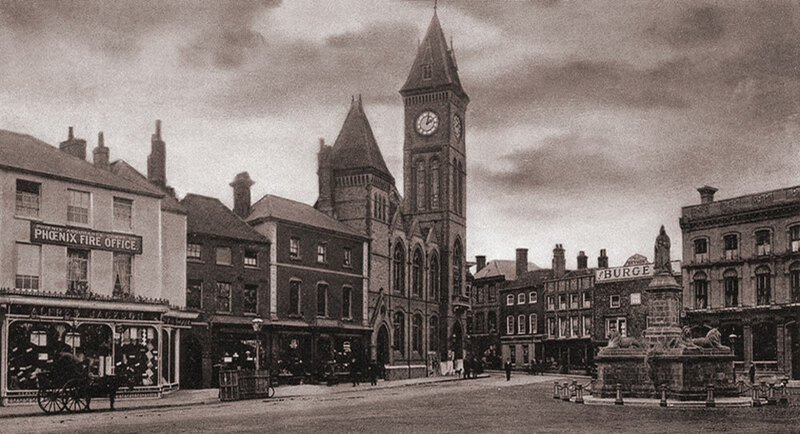 1840 St. Mary's Church to the south-west of Shaw House was rebuilt by architect Joseph Hansom (1803-1882), he was the inventor of the famous Hansom Cab while living in Hinckley, Leicestershire. 8th February 1851 Rev. Dr. Thomas Penrose died. In his will that was read on 19th March 1851, he left £200 (£21k today) to be invested in consols, the income generated would go to the benefit of the poor. 1851 Henry Richard Eyre (1813-1876), was the grandson of Sir Joseph Andrew's aunt, he had become the owner of the estate of Shaw House and also became an appointed Justice of the Peace. Henry had married Isabella Parker the previous year, they would have six children born between the years 1853 and 1860. Henry and Isabella employed 11 servants, five of those servants would be for the care of the children. Shaw House went through some improvements to update the house to improve access to various parts of the building, but would change the character of the Hall and the rooms above. An open loggia and panelled corridor that ran across the north side of the central range gave better access to different parts of the house without the need to pass through rooms, and some of the service areas were also brought up to date. The alterations concealed the north porch with the addition of the loggia, and there was a loss of light and views over the gardens from the large north facing windows. The sash windows were replaced with mullion windows, which restored the exterior of the building back to the original 16th Century appearance. The attic floor was converted to provide accommodation for the children as well as servants rooms. 1st June 1876 After a short illness, Henry died whilst at 12 Upper Brunswick Place in Brighton, Sussex at the age of 62. Isabella stayed at Shaw House with her children until her death in 1882. 1876 Henry John Eyre (1854-1917) inherited the Shaw House estate on the death of his father and the age of 22. 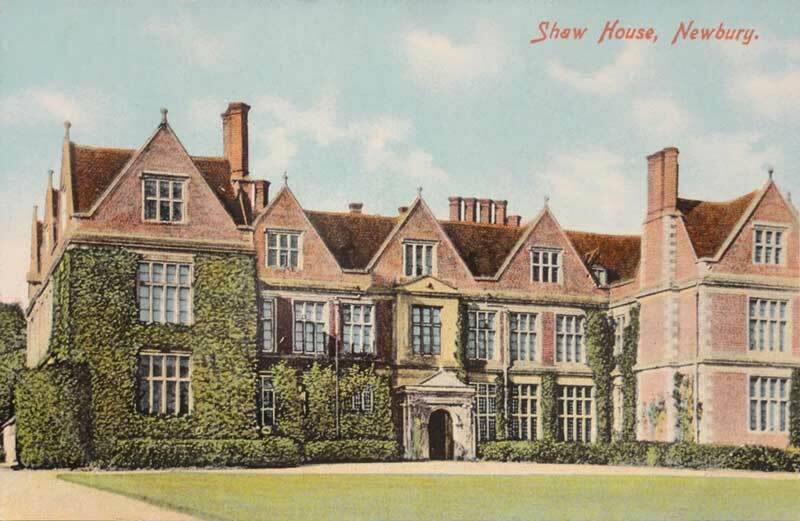 June 1888 The estate of Shaw House was put up for auction, but failed to reach the reserve of £60,000. 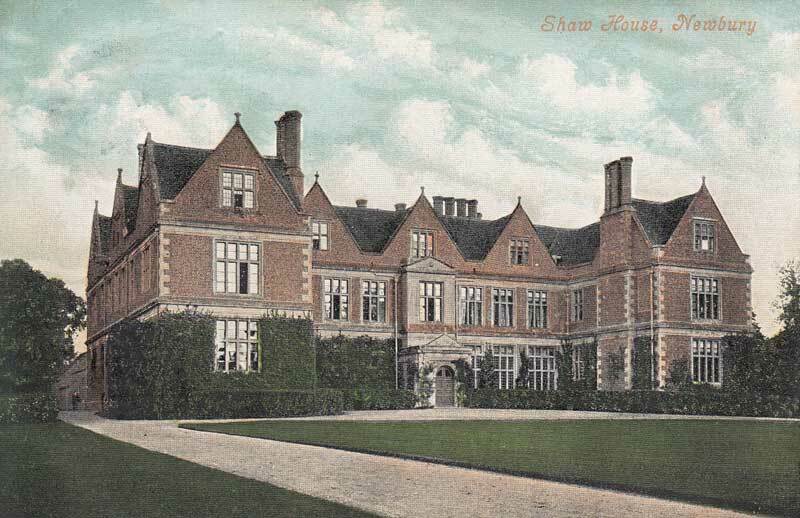 1891 Isabella left Shaw House and moved to Hall Dene in Merrow, in Surrey with her daughters, Isabella and Mabel. She became an acquaintance of the Farquhar family as they lived six miles away at the country estate at Polesden Lacey. Isabella died aged 84 at Hall Dene on 27th May 1904. 3rd August 1905 Hon. Kathleen Farquhar (1850-1935) was the new owner of the Shaw House estate after purchasing from the Eyre family. 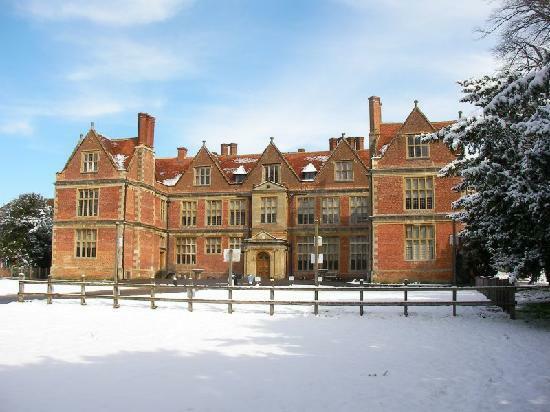 The local Newspaper the 'Newbury Weekly News' announced the sale of Shaw House. She was the daughter of Sir Thomas Bateson (1819-1890), 1st Lord Deramore of Co. Down, Ireland. Kathleen was also the wife of the late Walter Randolph Farquhar, he died in 1901. September 1905 Hamptons arranged the initial sale of the contents of the house, which had to be sold off before Mrs Farquhar moved in to the house, Christies would sell the more valuable items during December. 1907 Alterations were made to the look of the house by the architect Mr Fielding. Smaller rectangular panes of glass were inserted within the mullion windows, these can be still seen today. A room on the first floor in the north east of the building was panelled with Jacobean panelling, the room became known as Queen Anne's Bedroom. Part of the renovation work was the installation of electricity throughout the house. 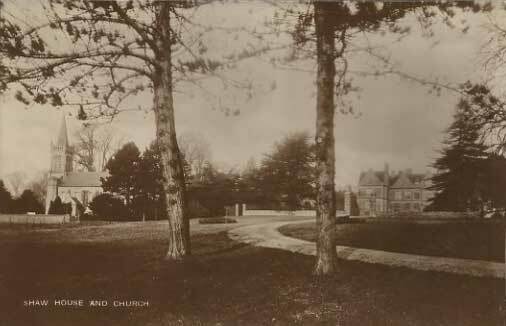 April 1907 On Good Friday, there was a dispute over the public right of way along Church Road to St. Mary's Church, the road that the driveway of Shaw House joined. Kathleen was upset by the noise of the increasing amount of traction engines and other vehicles using the road, she had the road barred by a locked gate. A defiant crowd of parishioners broke the gate down, this led to a major confrontation. 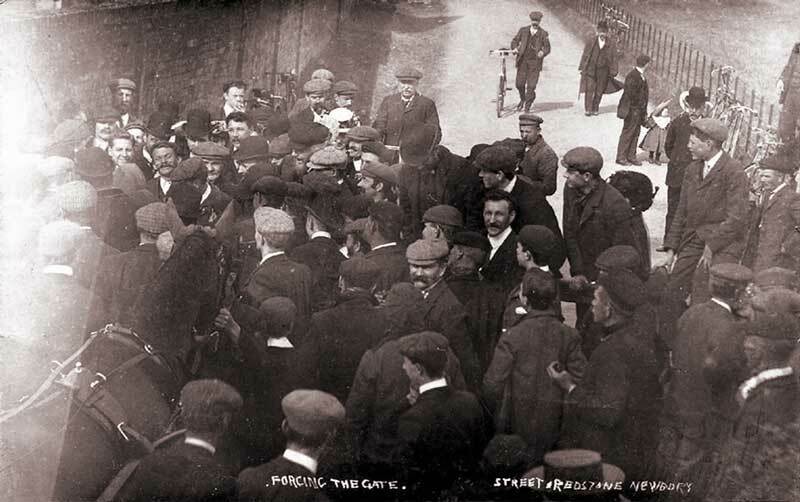 July 1908 the case went to the High Court, with numerous local people being called to give evidence of how the road had traditionally been used. Kathleen's intention was to make Church Road a private gated drive to keep the peaceful environment, public access would be at her discretion. The outcome of the Appeal was that Kathleen lost the case, she would have to give the public free access to the road. Kathleen had a wall with high railings and large central wrought-iron gates built to enclose the forecourt. A new driveway was made that lead from the gates to the front door of Shaw House, the old driveway became a gravel path which lead to a pedestrian gate in the newly built boundary wall. 15th October 1918 Kathleen's son, Sir Walter Farquhar, 5th Baronet Farquhar (1878-1918) Was killed in action during the First World War, whilst serving as a Captain in the Royal Field Artillery of the 59th Division in France. Previously he had fought at Gallipoli and in Egypt. A memorial to Sir Walter can be seen in St. Mary's Church on the south wall of the chancel. The widow of Sir Walter, Lady Violet Farquhar and their four children moved to Shaw House. Kathleen reorganised the House to better accommodate her grandchildren. The children had rooms on the second floor, Peter, Charles and Reginald were in one room, and their sister Ruth in another room that was close to the nursery. Kathleen employed a governess and an under-governess to teach the children. Other staff employed at Shaw House were, Margison the Butler had a room to the left of the front door, in the next room was the Housekeeper, Mrs Cotton. All the male servants had rooms to the north of the kitchen in the service range and in the stable yard. The eleven female servants had rooms in the west wing of the second floor, a red baize door separated the servants from the children's rooms. The staff would have their meals in the Servant's Hall, while Margison and Mrs Cotton had their meal in the Housekeeper's sitting room. The gardens were looked after by Mr Saunders the Head Gardener and five other gardeners. The lawn would be cut by a horse drawn lawnmower, the horse named Mick wore leather boots to prevent his hooves from damaging the lawn. July 1935 Sir Peter Farquhar, 5th Baronet Farquhar (1904-86) inherited the Shaw House estate when his grandmother Hon. Kathleen Farquhar died on 20th July 1935. 23rd June 1937 Sir Peter married Elizabeth Hurt, daughter of Lieutenant-Colonel Francis Cecil Albert Hurt. On 29th June 1938 their son Michael was born, just over a year Shaw House would become requisitioned for the use of the military during Britain's involvement of the Second World War. 1939 At the outbreak of the Second World War, Shaw House was requisitioned by the Government for the use of the Royal Army Ordnance Corps. Air raid shelters were built to the north of the house in the rose garden, and to the east of the forecourt a lavatory block was built, the grounds were used as a military training area. 1942 The House became occupied by over 200 men of the Air Landing Reconnaissance Squadron, later on they would take part in the Arnhem Campaign in 1944. Later in the year the House become the base for American and Canadian troops, these troops would eventually land on the Normandy beaches during D-Day in 1944. 10th February 1943 Newbury was bombed causing some buildings to be destroyed in the Town. 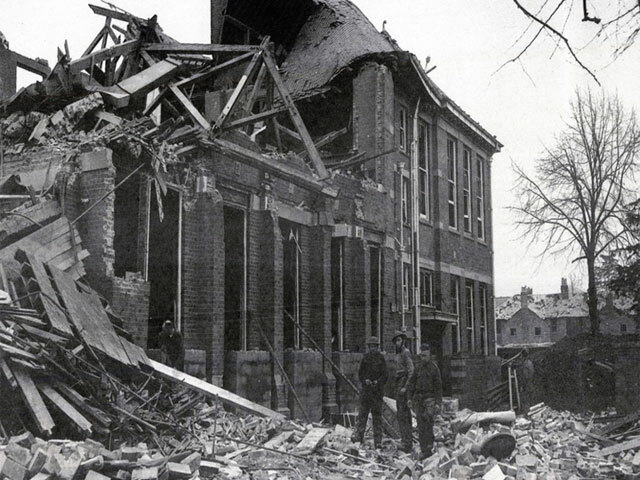 The Senior Council School was destroyed, killing three students and two teachers. The Army vacated Shaw House for it to become a school as a temporary measure. 20th June 1945 Shaw House had suffered damage through the years of occupation by the Army, Sir Peter Farquhar could not see a future for Shaw House to become a home for the Farquhar family again. Sir Peter put the Shaw House estate up for sale, a week later it was sold to St. Gabriel's School, but Berkshire Council retained the House for the Council School. 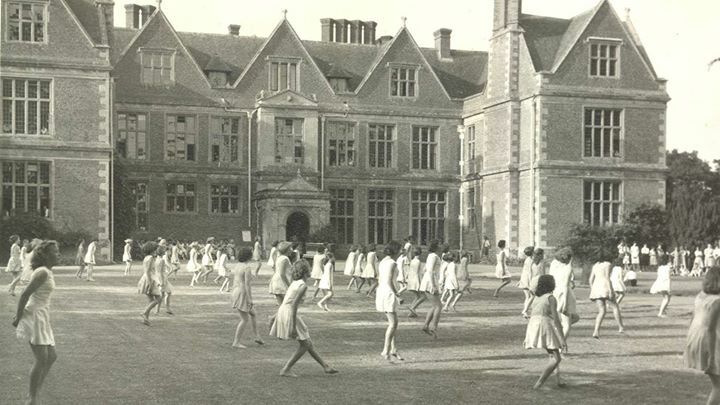 1949 Berkshire County Council purchased Shaw House for £13,000 to keep it as a Council School, the building was developed with improved facilities. 6th June 1952 Shaw House became a Grade I building by English Heritage (List entry No. 1220445). 1956 Due to Shaw House school not being large enough to accommodate both the boys and girls, the school become a girls only school, with the boys going to Park House school which was to the south side of the town. 1958 A gym was built and later an outside swimming pool to the east of the old stable block adjacent to Love Lane. 21st June 1961 The swimming pool was formally opened by Mrs Parker-Bowles of Donnington Castle House. 1963 Due to additional teaching space needed, Astley Building was built on the site of the old stable yard and Victorian Wilderness Garden to the west of the main House. Tarmac tennis courts were built in the former kitchen garden to the northeast of the House. 1979 Shaw House school became a comprehensive school, accommodating both boys and girls. 1985 Shaw House was declared as an unsafe building, by the discovery of serious structural defects. The students and teachers were evacuated from the House and moved to the surrounding modern buildings. After a period of 40 years, the House would never be used again as a school, and would sit empty for many years. 1998 The ownership Shaw House was passed to West Berkshire District Council when the new unitary authority took over the responsibilities of Berkshire County Council. 2003 Funds were raised to enable the restoration project to bring Shaw House back to its Elizabethan splendour. The funds came from the Heritage Lottery Fund (£4.2m), Vodafone (£1m), Berkshire County Council (£1m) and English Heritage (£125k). 2005 Work started on the £6m major restoration of Shaw House. The main contractors were William Sapcote & Sons from Birmingham, McCurdy & Co. from Stanford Dingley worked on the roof timbers. The building was repaired using original material, and unsympathetic modern decorations were removed. During the restoration, some William Morris wallpaper was found in the housekeeper's room, and wallpaper from 1750 when Joseph Andrews was the owner of Shaw House. 2008 Grade I listed Shaw House opened to the public as a venue for events, conferences, register office and as a historic attraction.